I know, I know, not what you guys expected to see here, but bear with me. Mary Greer sent me a wonderful video about the future of storytelling. Go take a look at it. I’ll wait. Of course card readers are storytellers, too – that’s part of what struck Mary about this. What struck me was – storytelling. The thing I’ve done all my life. It happens when I write about cards, too, or at least I hope it does, because telling stories – that’s how I try to reach you, to say something that’s important to me in a way that I hope you can understand. So here is the bible story I promised you in the title. You may know that the big event in the Jewish bible was when God called Moses to Mount Horeb to give him instructions on how the Jews were to live. The first time Moses attempted this the Jews behaved rather badly, with the upshot being that a couple of stone tablets containing some of God’s most important instructions were destroyed. A very bad thing, and that’s the story of the golden calf. That’s not our story, though. God didn’t give up. He called Moses back up the mountain. And God and Moses talked for forty days. It was a pretty wide-ranging conversation from the accounts. Many instructions were given, including a small thing – but it wasn’t, really. God told Moses that a special type of candlestick, called a menorah, needed to be made for use in the Sanctuary, and later, in the Temple. You can click through the wiki link to see what it probably looked like. Moses wrote down the instructions, which you can find in the bible. But if you want to know how the first menorah was actually created, you won’t find it in the bible. You need to turn to the oral tradition. God was dictating, and Moses was dutifully transcribing the words, but God could see that Moses wasn’t getting it. Not really. Moses had a lot of virtues, but he simply wasn’t a visual-spatial thinker. But God, being God, realised there was a way he could solve the problem. And what he did was this: He sent a vision of the menorah directly to the artist Bezalel. And from that, Bezalel could translate it, could make God’s vision of the menorah into a proper thing-of-beauty-in-the-world. Because that – that is what artists do. I wish this was more inspired, guys, I truly do. But when I thought about storytelling, that was the story that most came to mind. So I give it to you as part of this conversation amongst storytellers. It is only one perspective, albeit one that means something to me. Here’s what I’d like in return: Tell me a story about storytelling. Write it in the comments if you like, or on your own blog, or maybe make a Facebook post. Please – tell me a story. The subject is so very big, if you’re a storyteller, or a card reader, or you consider yourself both. And I don’t have any answers to how storytelling will evolve. But I know we need to keep telling stories. It’s been a while since I’ve done this. And really, I’m not quite sure where to start. The cartomancy community got fractured a few years ago, badly. 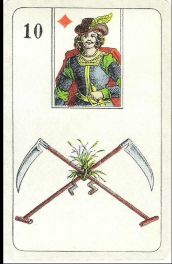 Over Lenormand. Suddenly, everybody had an opinion about this, about traditional reading. There were personal attacks – a lot of them. Not to mention a rash of plagiarism the likes of which I’d never seen before. It was all so ugly it’s just painful to think about. I’m not a fighter by nature. I’m just not. And this stuff – all this stuff that was happening – all these people with all these vicious words – it wasn’t helping. I don’t know how many friendships were broken over this. I don’t know how many livelihoods were lost. I don’t know how many good people got chased away from this community because they thought we were all crazy, and because it was a scary place to be, but it was more than a few. I saw so much of it. I went away. I felt so much like I’d failed. Failed the cards, failed history, failed – you. I started writing about Lenormand because it’s such a fun little deck, with a lot of history and a lot of folklore behind it. It has a wonderful reading method passed on by oral tradition that anyone can learn. I’ve gotten so much enjoyment out of it over the years, and I wanted to share that with you. After the Lenormand wars (isn’t that a silly concept?) started, the message, what I wanted to say – it got lost in the din. I was one of the first people to write about this deck in the English language. You couldn’t even get a copy of it outside of Europe and maybe Brasil back then. How times changed. There was a trickle of decks. Then a flood. And all these Lenormand experts appeared, pro-tradition and anti-tradition. I’m not really sure where they came from. Me, I’m not an expert. I know a lot about these cards, but I’m not an expert. But if you listened to these folks, a few things came to be considered pretty much fact, though the facts often contradicted each other. 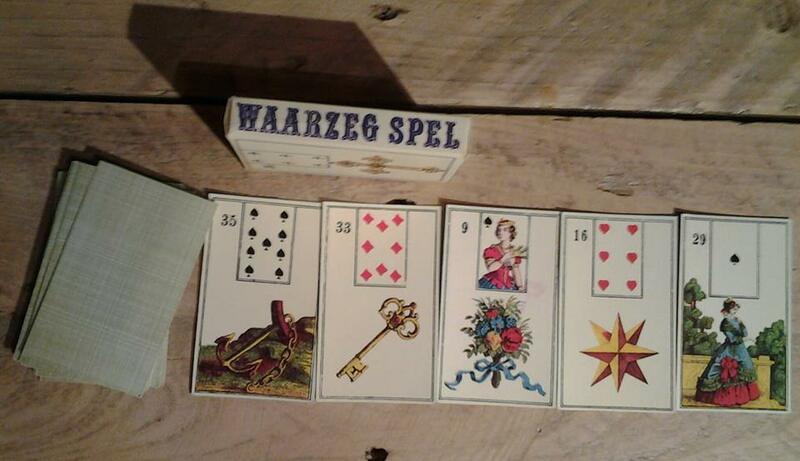 Tradition was designed to keep you out of Lenormand reading. That, they said, was only for the elite. Besides, it wasn’t even a living tradition. It was something stodgy and boring and near-death, and each card had a meaning that needed to be memorised. You’re a dilettante if you use card combinations (or if you don’t), proximity is the only true reading style, hell, if your deck has one bird on the Birds card, or three, instead of two, it’s not traditional. Even if you could remember that and the myriad other details, you could never read about your life. Because the cards were designed in the late 18th century, and people – they weren’t really people back then. They didn’t care about things like home, family, work, love. They weren’t like us. So…what you really had to do was to read with psychic ability, though it’s generally called ‘intuition’ in non-traditional circles. If you tried to learn traditional reading, you’d be brainwashed; made a sheep. It also meant you weren’t a creative person, because to be creative you need to have utter contempt for both knowledge and history. And if you don’t do it that way (which way? ), you’ll never be a real reader. If you’ve ever wondered why anyone outside this community thinks we’re crazy, why no-one wants to get involved with us, you don’t have to look much further than this. And it still goes on. Those folks lied to you. I’m pretty sure they lied to themselves, too, and probably fear of being wrong is what caused this inexorable split that looks so much the same on both sides. You lost, I lost, the cards lost. This neat little fortune-telling game – it wasn’t fun anymore. Too many people were trying to claim some identity for it, some personal or political symbol, and in all that madness, the deck itself pretty much disappeared. It simply couldn’t hold the weight. I’d like to try this again. Maybe this time I’ll do it better. I’m a traditional reader. We didn’t used to use the word ‘traditional’ to describe it until pretty recently, because it was simply how you read Lenormand cards. And at the end of the day – Lenormand is a deck of cards. Nobody’s going to come to your house and arrest you because you’re playing with it wrongly, and if anyone thinks ill of you for doing it – they’re wrong. Pure and simple. If that’s what you want to do – feel free. Please. But I would like to talk a little bit about what the tradition is, that thing I so much wanted to share with the English-speaking world. Tradition is inclusive. It’s alive. It’s designed to let you in. It’s also a lot of fun to learn and work with. You don’t have to use it if you don’t want to, but you’ll be no worse for learning a bit about it – I promise. Back in the days of pre-esoteric tarot (and even in the early days of esoteric tarot), card reading was a skill, a craft. Most card-readers were illiterate, so they passed on their knowledge through apprenticeships and orally. Lenormand falls squarely into this tradition. The deck has been used for a little under 200 years to tell fortunes, and wherever you find a pocket of Lenormand readers, whether it’s in Rio or Kiev, the Book + Gentleman is going to mean a man you don’t know yet, and the Gentleman + Book will mean a learned man. All around the world. For 200 years. Passed on by people who couldn’t read and write. And they did that because this language, this funky, wonderful card language – it mattered to them. A lot. They kept it going in the absolute faith that somewhere down the road, people like you and me would find it and get as much enjoyment out of it as they did. Think about that, for a couple of minutes. They didn’t do it to keep you out. They did it to let you in. As my friend Björn Meuris said: ‘Reading cards is a magical act. But you don’t have to be a magician to do it’. And he’s so right. You don’t need to be psychic, or clairvoyant, or have spirit guides, or do any rituals to read Lenormand. All you have to do is learn the craft of reading. There’s a lot more to talk about, I know. But for now I’d like to leave it here. Just for a bit. So…this is the new place. The old place got…well…see the picture above. Not quite sure what this one will be yet, except Lenormand, and fun.